It’s fall and will soon be winter. I have an earlier post on dressing to ride outside in the cold, and I mention training indoors. 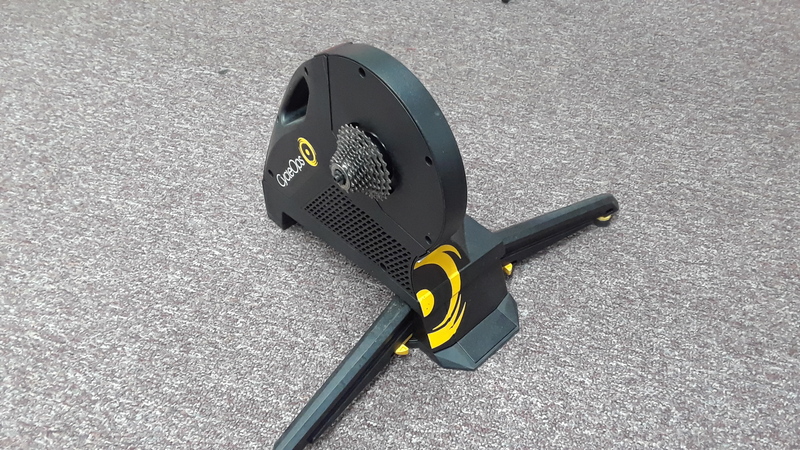 Here I thought I’d post a review of three smart trainers I have experience with: Bkool Pro, CycleOps Hammer, and TacX Neo. These trainers not only let you train inside, but enable you to have an immersive experience because they will automatically change resistance based on the program, which can either be a real-life video, a virtual world like Zwift, or even just a designed workout that keeps you at preset wattages. These will enable you to not only keep fitness over the winter, but actually increase your fitness. Another great feature is the ability to ride with and race against others in real time over the web with many of these programs. In fact, these smart trainers have become so popular, many people utilize them year round. I have been using smart trainers in my own winter training for the last 2 winters, so I’d like to share my experience in order to help you choose what may be best for you. I will note that I do not have a power meter separate from the trainer, so I cannot speak to their accuracy as far as the wattage they report. What I can say is that all three seemed fairly consistent toward each other as far as the power readings displayed compared to my perceived effort. It seemed to me they were all fairly accurate, or at least had similar degree of accuracy. I’ll start with the Bkool, as that was the first one I used. I used this for over one winter and a little the next, so a fair bit of time on it. I mainly used it with Zwift, though a few times with the Bkool program. Overall, it was a pretty good trainer. It simulated the hills pretty well, and responded pretty well to the gradient changes. I liked that it needed no calibration, just set the bike on and ride. Small, foldable, portable if needed, yet with the extending legs, pretty stable. There were two drawbacks. First, it didn’t do workouts on Zwift in ERG mode very well. For whatever reasons, it wouldn’t change resistance in the next block unless I stopped pedaling and let my avatar come to a stop. In other words, if the current block was 200 watts, and the next 100 watts, it would stay at 200. I just did work outs without using the ERG mode, which worked really well for me. Free ride mode worked great for general riding or doing group rides or races. (The ERG issue may have been remedied in an update, as the device has been updated a time or two since I last used it) The other issue was also fairly small – if you stood and really got on it, you would occasionally get tire slippage. This was due the design of having your weight hold down the bike on the trainer rather than having the roller tighten down on the rear wheel like other wheel-on trainers. So sometimes on steep inclines, if I stood and happened to lean too far forward, it would slip a little. It was actually somewhat realistic, as if you were on a steep climb maybe with an imperfect surface. Seated, the tire never slipped. Overall, a great piece of kit for the price (Less than $600 retail now). One other thing I should mention – Bkool takes care of you. I hadn’t used it in quite a while and accidentally plugged the power adapter for the Hammer into it – snap, crackle, pfft. Bkool has replaced the unit with a refurbished unit and sent a new power adapter. That’s pretty good service! 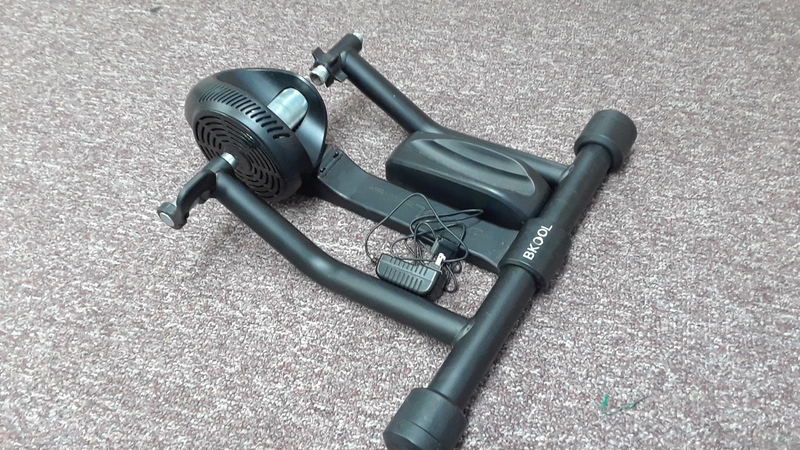 Although I enjoyed using the Bkool trainer, I wanted to try a wheel-off trainer, especially since they seemed so popular and got rave reviews. So I decided to try the Hammer, which was a fairly new release at the time (I had been thinking about the Neo, but it was sold out from the distributor at the moment, so I went ahead with the Hammer.) This unit is a beast, fairly heavy, not something you are going to lug around to different places to use. I used the Hammer last winter. No wheel slippage, of course, so that was a plus. Power seemed about the same as the Bkool. I don’t have a power meter, so I can’t tell any trainer’s accuracy in the that regard. However, my perceived effort for the wattage was about the same and FTP registered similar, maybe a few points less on the Hammer. ERG mode worked great for workouts! The trainer changed pretty quickly when you started the next segment of the workout. So that was a definite plus, even though in some ways I actually kind of liked not using ERG mode – it made you concentrate a bit more to make sure you were hitting the target wattage. But if you want to use ERG mode, it works well. 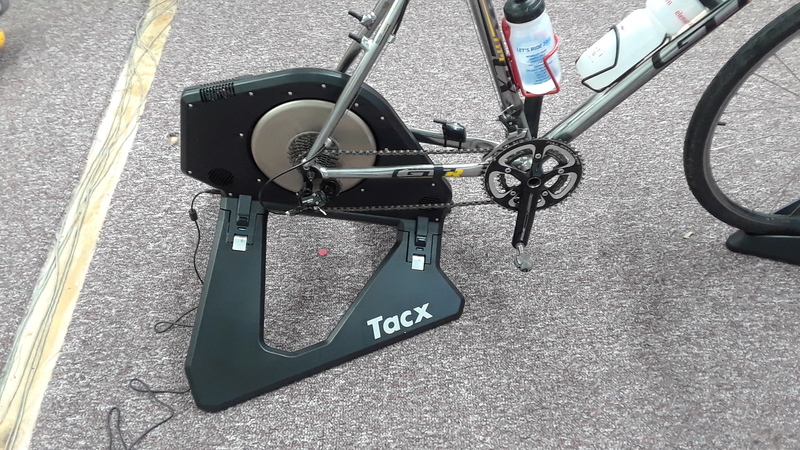 This trainer does require calibration any time you reinstall the bike on the trainer, but it’s a very simple process, takes just a couple minutes, and not required between uses if you’ve left the bike on the trainer. However, the Hammer had a serious flaw when free riding: you would descend a hill, ramp up power as you leveled out or started up the next hill, but the avatar would come to a stop as the trainer was not registering power, despite pedaling. I called Hammer in Jan or Feb and they were aware of the issue, but could not give me an eta on the firmware fix. This issue became very annoying when in free ride, and especially in a group or race, as you’d have to go super hard during that transition to make up for the drop in power (it was not an ANT+ dropout). I made up my mind I would get the Neo before this coming winter. With that issue, I could never recommend the Hammer. However, I just did the September update (hadn’t dug out the trainer over the summer), which claimed to fix the issue. I hopped on for a short ride, and the problem is much better. It’s not quite entirely fixed, but at least seems acceptable. Instead of dropping out for 10-15 seconds and letting the avatar come to a complete stop, the power dropped out for just a second or two and kicked back in. Hopefully, CycleOps will fix it completely. With that, I can now recommend the Hammer. It too, is a great piece of kit, especially for the price of $1200 retail for a wheel-off trainer. Heavy, but it is very stable. This brings me to the Neo, which I just picked up recently, so I don’t have much time on it, yet, just a few rides. It is a fair sized unit, you won’t really be lugging it around anywhere, though it does fold up. No calibration required, which is nice. Power readings seem similar to the other two trainers, no big difference. It does change with the gradients well, and certainly does not have the issue the Hammer originally had with dropping power during a transition from a descent. One neat feature is that you can use the trainer with or without plugging it in. I haven’t tried a full ride with it not plugged in, so I can’t comment if that affects the ride at all. Another plus is this trainer is super quiet, as in, you almost can’t even hear it (at least with a fan on). The other two trainers weren’t bad for noise, but this thing is near silent! The road feel simulation is a really cool feature, and it actually makes it feel different depending on the terrain. A wooden bridge feels like a wooden bridge! And gravel like gravel, etc. Pretty cool, adds to the realism, but certainly not a necessary feature. The trainer is also designed to rock a little side-to-side, which is really nice. The other two were not designed to (although with the adjustable feet on the Hammer not quite turned out all the way, and having it on carpet, it rocked just slightly while still feeling very stable). Freeride on Zwift is great. Workout mode using ERG seems to have a small bug. Sometimes the resistance will change very quickly when starting a new segment, but other times it takes 10 seconds or more to change the resistance. Generally, though, it changed quickly enough that the workout would be fine. Of course, I could always do the workouts without ERG like I used to do on the Bkool. This unit is quite a bit more expensive than the others at $1600, but it seems to be a very solid device and has a lot of great features, so well worth the money despite the large investment. Any of these three trainers make a great choice for training indoors this winter. If you have the funds, it’s hard not to recommend the Neo, it really is a nice machine, not to mention it looks like a Star Wars ship. Of course, we have a myriad of options and price points available, since each of these and other companies we carry have multiple models available. We’d be happy help you sort through the differences. Don’t let cold or snow let you from getting a great workout and having some fun in the process!